Jeremy Lin continued to show encouraging progress in his rehabbed body in the previous Bulls vs Hawks game to finish with 3 points, 3 assists, 4 rebounds, 2 turnovers in 19 minutes. His +9 was the second highest in the team after Dewayne Dedmon (+19) in the 85-97 loss. The starters struggled mightily in this game with roughly -18 to -21 but Lin managed to direct the 2nd unit and some starters with excellent playmaking to give the Hawks a chance in this game. Although his shooting rhythm (0-5) is not back yet, he continued to show his old form by drawing fouls and making sharper cuts and drives to orchestrate the offense. After the game, Lin posted a Bible verse on his Instagram account about not giving up hope and reaping the harvest at the proper time. He must have been encouraged with his improved game performance resulting in increased playing time from 9 minutes to 19 minutes. With 2 days rest, hopefully Lin can continue to build on this performance to regain his shooting rhythm and athleticism in the road game against the Philadelphia 76ers. My 2 cents is Lin may be given more minutes this game. Maybe not. Back 2 back. Unless he doesn’t play one of the two games. Pregame Warm Up – Jeremy Lin did this in Philadelphia in 2013. GO JLIN! A game they would have won had Mchale given the last shot to Lin instead of Parsons. Won’t able to watch the game but I have a feeling Lin will play no less than 15 minutes tonight. Go Lin! why not Win? Got to work? As usual, a few streams here work well. Go JLin! Just do your best and pray for continuing to stay healthy. Lin looks way too tentative except for the one drive. not looking at the rim to attack at all. Lin is getting better. The shot is not there yet. But it will come. Speed is picking up game by game. And he is more in the flow now compared with previous games. Baby steps. Not watching… I saw he had a turnover and a 1/3. Any reason why he might be playing so little? I don’t agree. Lin isn’t playing with aggression. Coach is fair to Lin. Lin playing time is based on how he plays. Tonight, he didn’t look good in his 4 minutes, so he was quickly subbed out and is not playing in the second quarter with the Hawks going with no PG when they took out Young. Well, at least, Lin knows the deal…He needs to concentrate on not turning the ball over. Too many turnovers in few minutes. He’s just not playing with confidence right now. His turnover was a forced pass to Dedmon on a drive. He had a clear shot yet he forced a pass. Then, with time running down, he held on to the ball too long and took a drive and didn’t get the shot off in time. A veteran player can’t do things like this and have the coach’s confidence. You’re being fair. Lin has to mentally step it up and not be a liability to his team when he plays. He showed more mental confidence in the previous game. at 2Q 4:00, Lin played 3 min. so far. Young 13 min. Who was the PG when both were out? How does Lin look today? He looked bad and with the exception of a lay-up in traffic that bounced in, looks unsteady and tentative. At least, we know the Hawks wants to win and for Lin to get more time, he’ll have to play better. hate to agree but true….it’s all mental for him at this point. I see (from responses below). I would wish that he could get another chance at some point in the 2nd quarter though. Hope he gets another chance at some point in this game. According to nba.com, Lin had one TO in 3 min. of PT so far with 1:45 remaining in 2Q. He’s not only shooting badly but turning the ball over at an high rate with so little minutes on the floor. His T.O rate per 36 is probably around 7-8. Way too high. Halftime. Lin was allowed to play 3 min. in two Quarters, the lowest of the bench. Dedman 13 min., Bembry 9 min. (2 TO), Spellman 7 min., Herter 9 min., Plumlee 6 min. How will this yo-yo PT bring back Lin’s mental strength and confidence. Sign! LA all over again! Halftime. Lin was allowed to play measly 3 (THREE) min. in two Quarters, the LOWEST of the bench. Dedman 13 min., Bembry 9 min. (2 TO’s), Herter 9 min., Spellman 7 min., Plumlee 6 min. How will this yo-yo PT bring back Lin’s mental strength and confidence?? He hardly warmed up before being pulled. they don’t need a back up point guard. They should just trade him to another team. Sorry, Lin has to play better. He played poorly. That holding the ball and not getting off a shot before the shot clock was a rookie mistake Lin had no business making. Sometimes we need to give Lin some tough love. To be fair to the coach, he looked bad out there. I did believe he was going to be given a base-line of about 15 minutes per game to bring him back slowly, but it looks increasingly like Lin will only play when he’s playing well. I hope a different Lin comes out the next stint. He shoots available shots and leads the team, not play as a complementary player but the veteran on the floor. Not sure who said this coach is smart. Sorry, just by looking at him, he does not appear to look smart. It does feel like LA. I mean, even if he played timidly for those 3-4 minutes, you gotta give the guy a little more chance than that. His turnover share is like 25% which is very high for the minutes he’s playing. If so, he should ride that bike straight outta Atlanta, like now! Anybody else think that any coach that claims that they will focus on defense this season is full of it? lol. making a statement he needs a bit more time on the court to warm up. That’s where I think he’s getting frustrated. The coach has him on a very short leach..If he makes a mistake, he gets the quick hook out. The trend of NBA is getting young players, develop (and tank), shoot more 3s, play no defense. Or build dynasties based on “star” players and hope they can play together. I don’t like the game that much now. Stars? those stars will get obsolete soon, with wave of young players coming every year. Announcer praised good, strong drive by Lin in Q1. Lin still not in with 6 minute deep into third quarter. Young is out but Lin not in. No PG line up. This gives more credence to Lowe’s article stating the coach feel Lin is so bad that sometimes, he goes with no PG instead of trusting Lin to play 15 minute back up PG off the bench. i’ve been saying that all along…..
Did Lowe really say that? 3Q 4:17. So far, Lin only saw the court for 3 minutes in 1Q. At this point, not sure Lin is coming back in this game. He believe Lin low minutes is solely based on him looking terrible and this is why the coach doesn’t play him much. I also look like a dummy but am a smart guy. lol According to my wife. Young dribble dribble dribble ….swat. they’re playing tomorrow so maybe this. Still believe he could play at least 15 minutes per night to get him warmed up. Maybe when ATL is getting blown out. It’s clear by now that the coach values scoring more than passing. No, it’s not as if I follow Lin that much now days. I just come to watch any highlights. I have been saying that at most Lin will play 15 minutes but only IF he plays well. The writing is on the wall. The young players will play back to back, like I said earlier this season, with coach rotating int Bembry as the PG, Lin is not getting any time even in BB. They are not watching Lin’s minutes. Trae is a joke, it’s like 4 on 5 when he is out there. NOT determined by his performance. Exactly, anyone thinks Lin not playing because coach has Lin’s best interest in mind is delusional. Bembry has more energy than Lin on both ends of the floor. If Pierce wants a competition to see who is more effective right now for his team, Lin’s not winning it. But, I still think that Lin’s health is most important. So, if he’s not ready to be more aggressive, so be it. I have to agree with you at this point. Sigh. He actually yelled at vince carter and waved him off. If Lin is so un playable, Hawks should just cut him. While he hasn’t played well at all, I feel the only way he’ll be able to shake off the rust is to play him at least 15 minutes per game. Lin, on his part, need to do a better job protecting the ball and hit his open 3’s. I can’t get too upset at the coach for not playing him but I do feel his playing time is way too unstable for him to get some rhythm going. Trae doesn’t space the floor well, only does lob passes close to paint because he can’t do anything else in the paint. Flashy moves and shiny shoes. That’s fair. Lin is a rhythm player. He needs more time to get it and get his confidence back. But at the same time, Lin needs a little different mentality when he comes in. Don’t force passes. If the coach measures other players with the same standard, then I say you are right we should not blame the coach, but that is obviously not the case. Did you see other players’ TO and no defense, and Young’s FG %, not to mention his no defense. Lin not playing because he’s not hitting his 3’s and turns the ball over at high rate. I did believe his playing time was based on being cautious. This is clearly not the case. Only hope for Lin is to go to the Rockets as back up to Chris Paul, now that would be great! w/Mike D Antoni! Dumb Morey would take him back cheap. How do you prevent a PG controversy? Prevent Lin from outshining Franchise rookie by benching him so you don’t deflate his ego. Can’t lead or get respect from the team staying on the Bench! I know things don’t look good for Lin, but he is a man of faith who believes in what will be and not what things seem to be. I expect Lin to not give up, believe, and to always give it all he has. I will patiently wait to see Lin overcome when the time is right as he has many times in the past. Go Lin! Lin is in a pretty bad situation. I expect it will take a few more games for Lin to figure out he needs to keep scoring like in Charlotte to get more consistent PT. He believes in playing the right way as a PG to set up his teammates first but that’s not what this coach is looking for. The coach simply wants a scoring PG in the mode of mini-Steph Curry. Score first, pass second. Maria, he played 19 minutes without hitting shots in the last game. 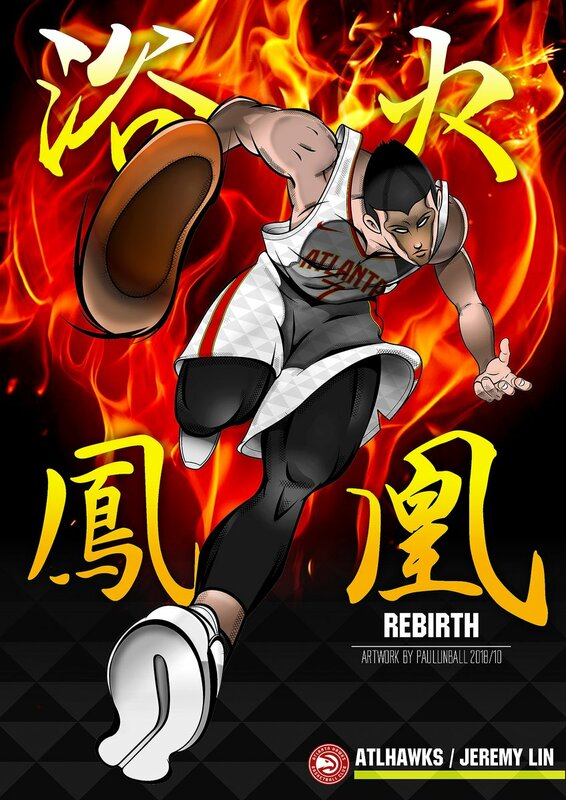 I think it is more based on Lin’s aggression and if he’s positively impacting the game. Maybe Lin finishes out the game. I am too dumb to figure out how to post a photo. Lin in to play final 4 minutes of garbage time. Just make your open shots Lin. He only sees the pine when it’s a blowout loss! lol 😂 I’ve never been so happy for garbage time. Hopefully Lin could use this time to resharpen his natural talent. Wow, Wilkens said you have to get the right minutes to get his rhythm back. The most unbiased thing he said about Lin. How is Lin moving to you guys? I think he looks a bit stiff. As I said several times before, it was obvious to me that the coach will treat Lin as a backup player to play during garbage time and to provide short rests for Trae. It kind of feels like Wilkins is not a Lin fan but being a fellow nba player, he is still sympathetic to Lin’s situation player to player. Hawks do NOT CARE about Lin. I don’t have access to the game, what happened in the third quarter? Looks like the hawks were still in it until then. well, at least, he was 2 for 4 50% FG LOL. I’ll take that. No assist tho . They were terrible in the 3rd quarter. Lin didn’t play at all in it. Or perhaps he does not like coach LP’s rotation and minutes assignment too. I already predicted that he won’t play much in this game because he played a lot in the last game due to minute restrictions. So that’s why I didn’t bother watching. Six games. He plays in garbage time means he has no injuries. Maybe he plays some tomorrow night. Grateful to see him play in every game. I think now that Lin plays for the Hawks, Wilkins may have accepted him into the Hawks family. He does sound sympathetic to Lin. 4Q final 5 min. of a blow-out loss. They can not make the shot, no defense and selfish. Coach did not do anything. Players played like crxp and LP did nothing. The only player LP gave consequences when not played his the best is Lin even he was one of the few played defense. I am done with LP, he is no different than other hater coaches. I think it’s not totally scoring. Because, in the previous game he took shots but didn’t score much. I think it’s energy, involvement, being a leader on the floor. I don’t think mentally he is showing much of that. Also, if Lin misses defensive assignments then that’s something to look at as well. But, most of the team does. I think one thing to consider always with a coach is, is this player at this time of the game impacting the floor positively? Is he making good passes, is he moving well without the ball, is he making cuts, is he hitting the open man at the right time, is he playing at the same pace as the rest of the team? Is he changing the pace, if needed? Is he organizing the team in a positive way? I think coaches based things on many considerations. And we just can’t continue to see things as what is the coach doing to Lin and nothing else or not consider that he has to consider other players too. That’s not how coaching a team works. As a sub, Lin can play with Bembry or Bembry can play PG, sort of. If Bembry is getting more rebounds, scoring more, and has more offensive and defensive energy then a coach, who is looking at the younger player who was injured last year a lot as well, and seeing positives and seeing maybe less with the rehabbing player. Sure, I’m not having fun watching Lin play so few minutes. But, I’m happy he plays the next game. That gives him a chance to get stronger and then figure out more of what the coach wants out of him. You’re a god-dam genius webattorney. You know that? You’re not even half as dumbb as you look. What I couldn’t understand was how the Hawks had 2 wins under this coach? Peachtreehoops stating Lin looks lost when out there: Lin is trying to play team ball and not iso, when Lin looks for open people, nobody is moving off ball or cutting, totally different type of offensive strategy. He needs to improve 1-1 handles for iso with this team. He’s still relying too much on first step which doesn’t work when they give him a little space. tha’ts why he has to be selfish zam it. Lin is stating he feels good! BEFORE the game! yeah…he’s trying to be a team player…..but nobody gives a damn about him….they are treating him like a third string PG…They don’t respect him. He should get the hell out of there or he’s wasting another year. The fact that LP gave some of Lin’s minutes to who?, “ADAMS” is alarming. I am sick and tired the way they are treating him. Even a 40 yr old VC gets more playing time. What has to bother Lin fan is the fact that LP didn’t play him in the second half until garbage time. You’d think he would had given him another chance to correct his bad plays in the second half. Sound like he’s going to really have to earn his minutes out there since he has almost no room for a bad outing. Coming back from injury, I thought they would show a little bit more patience. he looked for his own shot in the 1st quarter. LP gave him no minutes for the rest of the game until garbage time. we had to witness the full tank of plumlee getting minutes and bembry as backup pg. trae played well in memphis so they wont tank when that happens. and of course everyone wants to win their home opener. Well, glad to hear Dominique Wilkins stating Lin probably should be given a bit more time to get the rust out since he hasn’t played much in 2 years. Was surprised Wilkins said that since he’s known to not be too fond of Lin as a player. Even him can admit his unstable minutes won’t help him get to where he was pre-injury. A great gift Lin gives his previous coaches is by being a coach on the floor. Lin coaches and directs the team, teaches them how to play for the win as the season goes on. I don’t think Lin has done that this time probably because he doesn’t feel as confident to assert himself when he feels physically weaker, but mentally he knows far more then his teammates. If Pierce gave Lin the keys to be the coach on the floor, over time Lin would make him look like a genius in spite not being 100% because his teammates would get better. If Pierce doesn’t give Lin this duty, Lin may have to take it upon himself and demand it on the court to save this team. His smarter mind is always something Lin has to bring to give his team an advantage. I agree. I don’t think the spotty minutes given to Lin by Pierce is going to help Lin establish a rhythm. He just has to play more. So, despite all of the considerations Pierce needs to take with developing his team, one he has to give bigger priority to is Lin and continued minutes. If the trainer says it is ok, and I think she does, then Lin should play longer stints. And I don’t like keeping Lin out for so long and bringing him back in. He probably cooled off and stiffened up some. They should. Unless Pierce thought it was a mental error Lin shouldn’t make. But Lin is rehabbing mentally as well to the speed of the game. I am sooo fed up. The only player LP dare to bully is Lin. When is the discrimination against Asians going to end? Not only that but this is Trae’s team, Hawks don’t want Lin to be a leader. Lin used to impose his leadership and coaching skills too much when other franchise players didn’t want nor appreciated it. If Lin wants to be a leader he needs to look to score and get that AllStar and max contract first. 76ers just knows the Hawks too well. They wait for the 3rd Q to shut down and blow out the Hawks. I wish Joe Tsai could read what you said. He betrayed Lin. Pat Beverley didn’t get traded because he was injured. He said he loves Lin. B.S. Cause Hawks have a talented team, a great coach, and a legit franchise in Trae Young! Hawks don’t need Lin to win that’s for sure. Unless something happens to Trae, they are making the playoffs in the weak Eastern Conference, regardless of Lin’s minutes. IMO, Trae playing so much means he’ll be injured eventually. There’s no way his college body, used to a college sprint schedule, can withstand the drudgery of a 80 game marathon. The coach is setting him up for a body breakdown instead of acclimating him into a tougher environment. It may just work out for Linsanity to happen if that happens. Lin will have recovered by resting and slowly working his body back into shape. Coach wants his PG to play as a shoot first guard. Lin actually played well in the first 3 mins. The 1 TO could have easily been a foul and 2 FT. Bembry had 2 OT in the same timespan. When ATL got the expiring contract l, they already decided not to play him. Has nothing to do with how he well plays. Lin’s average FG% is far worst compared to Young’s. And Young is the new drafted franchise who can shoot well, they could careless about defense. No one cares if not Harden and Walker wouldn’t be a franchise. My thoughts too. Too many minutes running at a frantic pace up and down the floor. Putting hard miles on young skinny legs and they haven’t even played anybody hard yet! When they play CHA Kemba Walker will score 40 on young Trey. I had thought coach LP was trying to break JLin in slowly as part of his rehab. But these minutes JLin gets do not make sense. Second time now JLin goes into the game during garbage time, a good time to get injured by reckless undisciplined playing. It would have been interesting for JLin to say “uhhh, not this time coach. I’m too cold from sitting so long”. Not about discrimination, Hawks are developing their franchise and young players. They only got Lin for the expiring contract. Lin can ask to be waived but he needs those minutes to get back in shape. Also need them to prove to other teams he can still play! If Hawks goes to playoffs, Lin might get a chance to showcase for his next team. Need to be a scoring PG on every team regardless! Coaches who tells Lin to pass more are not put for his best interests! Lin also stubborn about passing but he need to get rid of that traditional PG mentality, that is gone! Unless you shooting 35pts and make crazy extended range 3s no one cares! The highlight today was Klay Thompson making 14 3s and breaking Curry’s single game record! GSW has their own star competition, KD vs Curry, Curry vs Thompson. When Lin starts to look for his own shot, he gets YANKED by the coach. Please, Trae is over hyped. Trae Young plays like Curry and doesn’t drive much so injuries are unlikely. Trae also doesn’t defend so it’s unlikely he get much wear and tear. Many rookies are injured when driving or defending. Trae’s extend range gives he mostly easy layups that he doesn’t have to worry abot contact. Benefits of the extended range are huge. Something Lin should consider mastering besides his 3 point shooting. Lin knows he doesn’t have the kind of talent that Trae has. It’s a one year rental. At that rate it’s doubtful any team would give Lin a starting spot. They put two Trae Young highlights in there ridiculous. Lin doesn’t seem phased by it, he knows his place on this team. Just need to get back to 100%. Goal isn’t to start or overdo anything for a 1 year rental, it’s to avoid injuries. That’s obvious, 1 year rental and developing Trae is their priority, everyone takes a backseat including Taurean Prince. No need for Lin to care bor create bonds with this team. There’s literally zero interactions between Lin and Trae cause it’s obvious there’s competition for the PG role. Trae and Lin are not happy for each other when they play well. Look at Lin’s reaction when Trae made that near half court 3 pointer to win the game few games ago. Agreed, LP played w/o PG for a long time today. He does not believe in Lin. We should have learned our lesson. First year coach does not have the guts nor vision to believe an Asian player. He does not want to be the laughing stock of the league. He is not smart enough to see Lin’s talents. I gave my benefit of doubt when I first saw his facial expression which does not look smart, but I thought I should not be judgemental, well, sure enough. He is just another NBA dumb coach. I totally understand that 🙂 At this point, it’s likely a 1-year rental until proven otherwise. I bought some Nets gear when they made some commitment but not Hawks’ yet. you’re more into light skinned brothers? Watched replay of game. The Hawks – no defense. 76ers killed them. Lin coming in with 5 mins left. Philly announcer, former teammate with Tommy Amaker, remembering TA was telling him how good Lin is. Lin didn’t get the minutes tonight. Looks like no one is happy here. I’m not thrilled either. I understand why people are disappointed. And need to vent. This is no fun. But what were our expectations exactly? The Hawks traded down and drafted a PG in JUNE. Traded for Lin in JULY. Then traded away their previous franchise PG. The entire team is one of the youngest (forget VC). Obvious Hawks are rebuilding around Trae Young. GM already stated why he acquired Lin. (And Lowe-life is criticizing Schlenk as dumb for doing it.) Starting Lin, playing lots of minutes, leading the team to playoffs. Definitely wasn’t part of the Hawks’ plans. Big picture. Last year, at this time. Did ANYONE think that we would even be at this stage of seeing Lin play in an NBA game? We all HOPED, but it wasn’t 100% certain. Seems like we have forgotten. As upsetting as it is, can’t say that I hold the Hawks accountable. The people I’m ticked off at, and CURSING at, are still Sean Marks and Joe Tsai. They were the ones who betrayed Lin and dumped him. Hindsight. Do we think that Lin would be any better off with the Nets? Guaranteed he would be seeing even less time. Nets would be using his rehab as cover. I have no idea why the weird rotations and minutes for Lin from the Hawks. Whatever the agenda, it’s a good thing that Schlenk was willing to trade for Lin. I am thankful, FOR NOW, that Lin is still an “ACTIVE” player on an NBA roster, back on a basketball court. We waited a whole year. Please, let’s give it a little more time. The highlights may be brief, but at least we have them. Only Lin knows what’s going on. Trust Lin to figure it out. Saw the postgame interview. I said, hmmm, that sidelines reporter looks familiar. Her name is Serena…..AHA! Serena Winters, from the Lakers! She has moved on to the 76ers. I remember Lin sent her a very nice thank-you and good-bye note. She was very appreciative. Did I mention anything about skin color? exactly, Young does not drive much and avoids contact and does not play defense, unlike Lin gives everything he has. Young already know how to protect himself, puts his health above anything else. Even this makes mad. Why Lin had to be the sacrificial lamb for his teams? Holy ****, Klay Thompson went OFF! Curry, Durant, and Thompson taking turns. And unselfish enough to allow each other to go off. WOW. Knock wood, GSW stays healthy, they are going to win it all again. Look, the entire NBA stinks. How many of us have already said that, if not for Lin, we would not be following any of it. And it’s not just Lin. Example, TJ McConnell. Played so well for the 76ers in the playoffs last year. He definitely contributed to their success. But now that Fultz is healthy, he’s another anointed one. So McConnell has been relegated back to backup, or whatever. That’s just how the NBA rolls. Thanks for the interesting hindsight if Lin would be better off with the Nets or the Hawks. I have to say with DLo, Dinwiddie, and LeVert’s emergence, Lin’s role at the Nets would be even more marginalized especially with less than 100% ability. There’s simply less PT there. It’s not fun being a Lin fan now but NBA season is a marathon and 82 games is a long season. Lin is slowly regaining his form so he just needs to bide his time and wait for the right time to shine just like he did in the Knicks. He just needs to improving his health and peak at the right moment after players wear down a bit with nicks and dings. I also trust Lin is a survivor. He’ll figure out what needs to be done to shine closer to the Feb trade deadline and the end of the season. I know it’s not ideal. I too have to keep reminding myself. But this is the path that Lin is on now. So we just have to hang with him a little longer. TV LP only had the Philly feed. WOW – Dominique Wilkins saying he talked to Lin, and saying Lin needs minutes to get in rhythm! I can’t believe my ears. Maybe DW has sympathy and respect for Lin now. Because he too had to recover from Achilles injury. DW official title is VP Basketball. Maybe he has influence and he will speak up for Lin. We can hope! LOL. Probably had to make the video longer. Haha. Haha. Nets lost to the Knicks. Couldn’t decide which team I wanted to lose. Like, Rockets vs Lakers. Hmmmm, hate them both. The list is growing. It’s getting tougher. LOL. I know this is a reality show. So, not sure how much of it is scripted or not. But, listen to Lin giving advice to one of the guys on his team. This is Lin’s mentality. MAKE HIS TEAMMATES BETTER. He is who he is. I’m trying to understand what Coach Pierce looks for in his PG. His answer on Trae’s question might offer some insight of what he looks for. and shots didn’t fall when we needed them to. Young plays with a lot of confidence. Sure, why not. He knows he’s been given the keys this year. He knows the team is more or less all about him, and making him better. So far, in the few minutes they’ve shared. At least he was willing to pass the ball to Lin. I’m not going to hate on the kid yet. It’s not his fault that Lin is in his current predicament. Unlike in Houston, where Lin was there first, and was led to believe he would be a centerpiece. IMO, different situation. Come on, nothing that we haven’t seen Lin do, and do better. Lin has had tons of highlight worthy assists! Schlenk has said the same thing during Summer League. That he was more impressed by Young’s passing abilities than his shooting abilities. So, he doesn’t feel he needs to have a “point guard” on the floor. But, how does that fit with what they want from Young? WHAT DO THEY WANT FROM LIN? As I mentioned, I wish Chinese media would have the “guts” to ask. Wonder if the questions are pre-arranged and vetted ahead of time. Rookie coach. He’s still trying to figure things out? With the various injuries, trying to find the right combinations of rotations? Reminds me of Kenny. Sigh. Take command of the offense. to early to tell, but we can see the signs as team plays…until we conclude whether what is his agenda later. I wonder if Schlenk and Pierce are thinking of creating mini-Warriors. All rely on ball movement, almost all can shoot 3s, two or three playmakers. That seems to be the direction of modern basketball. The PGs might be the best playmakers but they might need to be the best scorers, too. I hope Lin knows what Pierce wants from him so he can get more PT. I see Lin is getting more aggressive to score in the past 2 games so that’s a good thing. There might be patterns that early turnovers without many points (and assists) might relegate Lin to the bench longer and only get some garbage time. We have to see if this continues in the next few games. I don’t really feel comfortable talking about injuries to other players. I do think Trae will hit a wall. I think Trae will struggle against top teams. I think the way the team looked in the 3rd, without a veteran PG organizing them, will surface in more games. I hope Trae can remain healthy but he’s getting too many minutes. I don’t think the 2012 version of Linsanity will occur again. However, there are other forms of Linsanity so I don’t really know what you mean by it. All I want to see is Lin be the force that guides to winning and having his team believe they can win by the various ways Lin shows them how to win. If that’s what you mean by Linsanity, that’s always possible. I think Lin is far away from where he needs to be. Pierce is not only Lin’s coach, he’s the developmental coach for a lot of young players. I think Lin played 19 minutes last game because he positively impacted the game. I think he didn’t tonight because he made rookie mistakes. Lin is still not there mentally. That doesn’t mean next game he won’t show progress. And, he’s playing tomorrow (unless the team decides to rest him for a back to back). As long as he’s playing tomorrow, or the next game whenever that is, there’s a chance he’ll find “it.” And be the Lin we know and love. Then we’ll see what happens. Later in the season is just too far for me to envision right now. Each game is a gift. I don’t really see Lin “mentoring” anybody at the moment. Although in the highlights from the 18 mins game, there were some shots of him giving advice or directions to Dedmon and Bazemore. I think he’s still affected by all the heart he put into the young guys on the Nets. And then being ejected. I think Lin is in a different place and situation now. I think he is going to hold back this time. ??? If it’s so easy to do what Klay and Steph does, everybody and anybody would be good at it. They’re all trying, but no one else is close. It is a special talent. Klay and Steph are really something. But even they have off days. Klay had a bad game the other day against the Nets. Made up for it tonight! Being a Lin fan is very rough, especially these past 2 years. It’s even tougher right now, seeing Lin struggle and not get playtime, which adds to his struggles. We all need to be patient. Always remember it’s 20x tougher, more frustrating, and unbearable for Lin himself. He knows what he can do and the value he could add to any NBA team, but his body isn’t fully ready, he has to protect his body, and relearn how to move, shoot, and play again in the cut throat NBA. Nobody has come back 100% from the injury Lin suffered in any sport, but Lin has put in the work and effort to resurrect his career… again. Let’s all hope and pray he does, and prove the world and haters wrong again. Yup. It’s tough. So many things he’s trying to learn and apply. How to move properly and not get hurt again. New city, new teammates, new coach, new system. Lin doesn’t have trouble scoring. We’ve seen that. And he’s always talking about playing aggressive. On the other hand, he’s always talking about playing the right way, sharing the ball. And making teammates better. So, another puzzle. Quick turnaround. Another game tomorrow. Yes, let’s see what happens. Been saying for years how Lin relied too much on his driving game while his 3 point shooting got worst especially after changing his shooting form. Now he need to work on his 3s and extend that range as well to stay relevant. Lin has actually improved his 3-point shooting every year except in Charlotte. He knew years ago that he couldn’t keep relying on his freakish speed / first step and great driving skills. That’s why he changed his shooting mechanics, because he knew his 3-point shooting wasn’t good enough and it also made him too tired because he was jumping wrong to shoot 3s. This year is different because Lin had to rebuild his body, relearn how to play basketball, protect his body a lot more, AND deal with 3rd stringer playtime. We won’t see Lin regain his 3-point shooting for at least another month or two… if Pierce finally gives Lin the playtime he needs to get into rhythm. It’s so hard to say. Based on what we’ve seen with Lin, hard to guess what agenda these NBA teams have. Look at all the other dysfunctional teams. Timberwolves, Cavaliers, Suns, Wizards. But agree that JLin doesn’t seem to have bought into the Hawks yet. After training camp, pre-season, 6 games, still doesn’t seem to be quite comfortable yet. Whatever frustration we feel as Lin fans won’t compare with his own because he put so much blood, tears, and sweat (literally) into coming back stronger. His story is still being written and we’re fully behind him. Hm, May … might have to switch jersey to do so. Because the 2 teams that they beat (CLE and DAL) have a combined 2-10 record. NBA has been generous to the Hawks to give the easiest schedule in the early season. They’ll meet CLE (0-6) again tomorrow. And this time Kevin Love is out injured. Expect some star-making effort again. I’m impressed by Young’s scoring ability which does mirror Steph Curry. Not too impressed by Young’s passing either, but you gotta give it to him, those simple passes and on the break passes have been effective in gaining him assists. It’s something Lin can learn as well, he forces passes and assists way too much. Too many of Lin’s passes ends up as wasted possessions. This season it’s like GSW is having their own inner circle competition! Curry playing like he did few seasons ago when he won MVP! KD vs Curry and Curry vs Thompson! If both Curry and Thompson shoots like that during Finals, the best part won’t be which team wins the trophy but who will win Finals MVP, Curry or Thompson! Hawks probably filled JLin on their plans for him. That’s probably why JLin isn’t too committed to bonding with his teammates and such this time around. Coach and ATL never gave much media attention to the signing of Lin, nor did they say anything about starting Lin. Unlike Nets, ATL from day one said their franchise was Trae Young. Lin knew this, but what he needs is a chance to prove himself for the next contract. What ATL plans to do doesn’t have Lin in it so there’ no reasons to play him heavy minutes. Hold up, it’s Lin’s choice to be a two way player and pass to teammates! it’s his style of basketball and no one’s forcing him to do anything! If Lin doesn’t like losing and giving up shots, that’s why he works so hard on defense. Lin can certainly learn from Trae in protecting himself from injury with less reckless driving, easy assists, and extended 3 point range. So long as Lin can’t hit automatic 3s and extend his range, he will struggle. The only reliable arsenal Lin has left right now is his mid range jumper that’s about it. During Hornets was the time when Lin changed his shooting form and after that his 3 pointers were never the same nor as efficient again. During this off season I felt like Lin’s 3s looked super smooth and the best I’m seen but from what we’ve seen so far, it’s no the case at all. Klay and Steph were both drafted by GSW and developed together. Their amicable competition/rivalry definitely gives them the extra motivation to one up the other! It doesn’t help that Lin lost 2 season to injuries when those off seasons could’ve been used for 3 point training. Im not wishing Trae ill at all. I’m just stated facts. The chance of a skinny, small rookie playing every night as starter not getting fatigue related injuries is very high. The coach and GM are doing a disservice to traes body, one that could hurt his longevity as a player. I’m all for making sure Lin’s body is ready. That’s why I’m not upset he’s playing less than a third string player. The rehab takes time but so does turning a rookie into an NBA player. The speed and intensity level between college and pros require adjustments. BUT THE THING BOTH TRAE AND LIN NEEDS TO LEARN THE MOST IS ENDURANCE!. I don’t care how talented you are as a runner. You can’t be Usane Bolt one day and a Nigerian marathoner the next. The NBA as a league destroys a lot of young talent by selling false hopes to fans. It took Curry 3 years to become a starter and franchise player and he had a near career ending injury. GSW were lucky ( or by design ) that they Curry was a backup PG as a rookie. It is a disservice to wide eyed rookies to mistreat their young bodies like they have. I have to admit that this new body has thrown Lin’s timing off. Lin plays just like Lin in his first season with the GS with the difference that he’s now a veteran and he knows the game much better than before. So it would probably take him less time to get this body in shape. Lin played only 9 mins this game but I bet he had practiced with the team for much longer minutes. All of these basketball activities would help Lin to improve on this new body. Before long, you will see Linsanity erupts. The progress of this new body will be slow but steady. Lin has played only a few games since Oct 2, the date of his first preseason game against Pelicans. It is less than a month. If you recall how Trae Young did in his first month of professional basketball, you would understand how tough was it for Lin.with a new body. Plus Lin started this season entirely on the bench not like Young as starters. Lin got much less play time than Young. We should at least give Lin one or two months before making conclusion about his new body. Being in this business too long as fan, any words coming out from anyone means NOTHING. Once things turn SOUTH, they will find all kind of excuses to justify what they do. I blame Jesus. Lin loves him so much but the only chance Lin has to run his own team, all the injuries suddenly creep in when Lin has worked so hard on his game. Talk about bad luck. Lin would have been special in leading Brooklyn back to the playoffs but now we’re looking at his last year in the league. Sad. Lin will make the best use of his minutes. There is no garbage time for him. He simply played ferocious defense and attack. His strength and tempo will come back one day. All his work will bear fruit. Lin has never made excuses. Where did the stat come from? Do you also have the TO stat for his teammates? LOL, exactly, that was what I was thinking while reading it, then saw your comments. I didn’t think for a moment you were wishing Trae injured. So, I just wanted to make that clear to you. It’s a possibility based on thrusting him into playing so many minutes so soon .That actually happened with Lin with the Knicks. He injured his meniscus a few months after his minutes were ramped up. The key word is winning. It’s cheap to promote a player without mentioning it, and a lot teams are doing it to make money out of clueless fans. Lin is famous because we all know he is able to elevate the team for more wins if given the key. Look at Klay Thompson, he shoots and defenss better than Lin and even he’s playing 3rd fiddle to KD and Curry for 2 seasons! There’s no way any team will give Lin the keys, at his age with less athleticism they’d rather rebuild with a young PG! The most Lin can hope for is to be 2nd option. Lin does have problem scoring, his 3s are at a low percentage. His drives are less effective without the jumping and athletic ability. Only thing Lin cam shoot are mid jumpers right now. I am glad Young tries to share the ball. Unfortunately, I was not able to watch the game last evening but followed “play by play” …and waited patiently a long time but no JL until the end! I hope he will get more minutes this evening. I think with Lin it might be /- but it is different with the younger players. I see three playmakers. Trae, Bembry and Lin. Prince mostly looks to create his own shot. It seems Pierce loves Bembry. And sometimes he likes to see Bembry run the point. Often it seems lately it is the 3Q. There are a lot of games this week for the Hawks. Monday, Tuesday, Thursday and Saturday. That’s 4 games in 6 nights. One on one scoring? Lin? What koolaid have you been drinking?! Lin’s weakest offense is one on one scoring! How many times have we seen Lin shy away from a 3 pointer when being closel defended instead of taking a contested shot? Lin does the obvious head fake to get closer to the rim far too often. He needs players to respect his 3s and they don’t cause it’s mostly misses. I was referring to Pre-injury Lin and more specifically, Lin’s mindset. Yes, time and time and time again. NO LIN NO WIN. That’s right. When the stats are correlated with losing, it is like faking to get your money. Yes but we have to look at the current Lin and it’s not looking good. He can barely jump, and lost his speed. Comparing him to Young, I’d choose Young too. Look at Rockets they are a offensive based team, Harden’s defense js crap yet somehow they will have 4 stars soon! Sure they won’t win a ring but who will against GSW? JLin on the way baaaaack!